The babies and I just got back from a "shopping spree" in which I bought them shoes, slippers, nighties, socks and jackets. Gone are the days of meandering through boutique after boutique looking for purses, perusing the dress selection and impulse-buying that adorable centerpiece. When you're shopping with toddlers, you've got one shot, and you had better make it count. We chose Target. 1) You cannot find anything. Why is it that toddler socks are not near toddler shoes, and that toddler shoes are not in the regular shoe department, nor in the toddler clothing department, but hidden away in a little off-the-beaten-track nook? 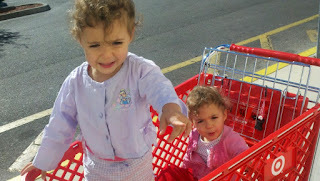 I have twins sitting precariously in a Target shopping cart. We don't fit into nooks. Someone should rearrange the children's section so that it makes sense. Everything should be out in the open, and one item should transition to the next. 2) Everything looks ridiculous. All I wanted for my kids were a few solid jackets in neither pink nor purple. What is it about a two year old that screams "I need polka dots and stripes!" Nothing matches polka dots or stripes. When you finally do find something in a solid cream color, for example, you rejoice until you notice the garrish Cinderella, Winnie the Pooh or Dora the Explorer emblem in neon colors on the back. In contrast, the little girls' section has more fashionable items than the women's section - cute little coats with belts, newsboy caps and trendy jeans mocked me, all being just a little too big for my girls. Apparently, four years old is the age for fashion, these days. 3) Everything is ridiculously expensive. When we finally did find the socks (a lucky break - I spotted them while we were on our way to the checkout), I had the option of bright pink and green patterned socks in a pack of three or days-of-the-week socks in a pack of (obviously) seven. They were $6 and $10, respectively. Meanwhile, a large bag of little girls' socks beckoned to me at $5 for 10 pairs. Again, way too big. Why the mark up for toddler-wear? Less material is used, after all. Perhaps they're more expensive to cover the costs of the silly designs and colors used to make them. In my dream world, a Target or a Walmart or a Kohls would have every item I wished for in the same section. They'd at least give me the option to buy my kids normal-looking clothing, and they'd knock the price down to a rate comparable with the rest of the merchandise in the store. Of course, while I'm dreaming, maybe they could potty train my kids while we're there. The baby/toddler section at Target makes me want to scream. I wish they would separate the boys clothing from the girls clothing! For some reason, finding shirts for my 2 year old son at Target is like finding a needle in a pink and frilly haystack. Just wait until your kids become a size 8--they will suddenly only have whore clothes to choose from. You will long for the days of Dora the Explorer!!! Yes! I considered leaving the picture out of this post because I know there are safety issues involved, but, honestly, what else can I do? Our TJ Maxx is near the Publix, and I will admit right here that when we hazard a visit, I will take a Publix cart, designed for multiples and use it at the TJ Maxx.